The WWE WrestleMania 35 pay-per-view is presented by Monday Night Raw and SmackDown Live and scheduled for April 7, 2019 at the MetLife Stadium in East Rutherford, New Jersey. Follow along here for spoilers and information on the event's card, lineup of matches and news regarding the pay-per-view. The following are my predictions for the WWE WrestleMania 2019 PPV. 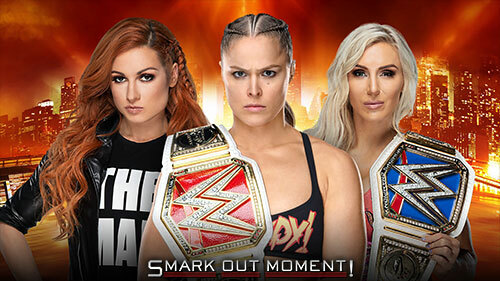 Check back for WrestleMania XXXV results and review coverage here when the time comes..
Becky Lynch absolutely has to win this, right? They wouldn't be stupid enough to end WrestleMania by having Ronda Rousey or Charlotte Flair as dual-champion and the arena booing the first-ever women's main event...right? Right?. PREDICTION: Lynch wins the title and Rousey takes time off. Either Rollins takes the title off Lesnar and they restore Raw back to some kind of balance, or they keep it on Lesnar because they DESPERATELY want Roman Reigns to return to fill that top spot again, be it at SummerSlam or hell, even WrestleMania 36 if they're willing to go along with history and just keep it on Lesnar like they always do. I really hope Rollins wins, but I have no faith that will happen and I legitimately have no interest in this match and am more excited about seeing the opening video package to WrestleMania than seeing what these two do. Isn't that sad? That's what happens when WWE books Lesnar the way they've done the past 3 years. This whole Kofi Kingston thing certainly wasn't planned, as Mustafa Ali was supposed to be in the Elimination Chamber match, but the groundswell of support for Kofi forced WWE to go in this direction. I'm super glad they're doing it. It's something different (despite how we've seen Kingston fight Bryan at Elimination Chamber) and it's refreshing to see someone like Kingston get his just due. I really hope they actually put the title on him, even if it's just for a short transitional reign. That would be really special. PREDICTION: Daniel Bryan retains the title and it's "good enough" for Kofi to get that spotlight. The most interesting part about this feud is how Triple H was able to heal that fast. Other than that, meh. I think it's a waste, to be honest. PREDICTION: Triple H wins and this is Batista's final match, I'm assuming. Why do I feel like this is just a setup and he's not actually facing Corbin? If he does just face Corbin, that's underwhelming. I'm assuming he destroys Corbin in a squash and then says he doesn't want to go out like that, which is where John Cena comes into play, or The Undertaker (but I'm leaning toward Cena). I'm not so into this. I'm a huge fan of The Miz, but I don't think Shane McMahon needs to keep having matches at WrestleMania and I feel like The Miz deserved better than this, and this match doesn't justify being on a card that is so stacked as it is. But hey, AJ Styles and McMahon had a good match, so maybe this will all work out. I hope I'm wrong about my foresight. Thankfully, they added the Falls Count Anywhere stipulation to help make this better. This seems to be a regular match that will be somewhere in the midcard, but I dig it. Their promo back-and-forth on SmackDown 3/12 was awesome. This could be a world title program this year. Why is it being wasted as a random match at WrestleMania when the card is already so damn stacked? It seems like a misstep that we're all going to regret WWE doing over the course of the year. Maybe I'm wrong, but I don't think I will be. WWE won't likely bother thinking of any potential winners until maybe a few days before WrestleMania itself, cause they don't care. This year, it seems there are going to be quite a few names in this, so at least that's good. PREDICTION: Braun Strowman makes the most sense, so probably Lars Sullivan wins just to do something unexpected. Well this is underwhelming as the two have been fighting each other for a month, and it also means no Andrade singles match against Mysterio. Admittedly, I'm glad these two are fighting each other, and in any other scenario, this would be a good match and a worthwhile thing to advertise for WrestleMania, but I always feel like Mania shouldn't have matches that have happened repeatedly around the same time frame. If they had kept these two away from each other instead of wrestling so much recently, I'd be much more into it. I also feel disappointed in the lack of the Andrade match (which I know goes against my theory about rematches) and no Joe vs. John Cena scenario, too. PREDICTION: Rey Mysterio wins the title here so he can drop it to Andrade. This tournament had such underwhelming options and there wasn't a single match possible from the lineup that I think would have felt special. I can't help but to just feel so "meh" about it. I guess they're going with Nese so they can try to play off their friendship as being "interesting" for an angle (it isn't) and to push Nese in that spot since he's from New York. Don't be surprised if nobody at all cares, which is sad, as 205 Live could be so much better. A regular match between Lashley and Balor just seems so flat, and I say that knowing full well that Demon Balor means absolutely nothing to me. This is so incredibly underwhelming that I wouldn't mind if it actually got cut from the card, even though I hate the idea of the Intercontinental Championship being sidelined like that. Lashley and Balor could have been a good match for this card if it wasn't done 50x leading up to the event. PREDICTION: It all depends on the Superstar Shake-up. If Balor goes to SmackDown, I think Lashley retains. If Joe or Mysterio goes to Raw as United States champion, then Balor wins the title and goes to SmackDown. If Balor is going to stay on Raw, then Lashley retains. I had thought Team Besties and The Bella Twins were the main potentials, but they've been replaced by The Divas of Doom. Unfortunately, Nia Jax and Tamina are still somehow in the mix. I don't know why, considering they definitively lost their previous two attempts to win the titles and they aren't some team that people would clamor to see. Lame. The IIconics are at least in the match, too, though. At least they're getting some recognition to do. This will only be the third pay-per-view they competed at in the past year, which is crazy. PREDICTION: Banks and Bayley win. This will feature everyone else who isn't in the three other matches. PREDICTION: Top picks are Asuka, Lacey Evans, Mandy Rose, Shayna Baszler and Bianca Belair. I'll lean towards the safe bet of Asuka for now. Curious why The Hardy Boyz weren't in this, instead of Black and Ricochet, but hey, I won't complain. This will be a good match. I don't have too much to say about it, as it isn't the most thrilling thing in the world, but the match itself should hold its own and deliver. Since The Usos have supposedly signed new contracts with WWE, I don't think they're losing the titles just yet, although if they do, it will certainly be to Black and Ricochet. PREDICTION: The Usos retain the titles. Since they're in New York (sort of), I think this absolutely has to be when Hawkins ends his losing streak and The Major Bros win the titles for the first time in 11 years. PREDICTION: Curt Hawkins and Zack Ryder win the titles.